For Millicent, a once French noblewoman turned immortal vampire, forever is a long time to live in despair. The love of her life is murdered the night she becomes immortal. Millicent spends her endless night in a melancholy which never ends. Two hundred forty years later, she locks eyes with an English actor, who happens to look exactly like her long dead love. Sadness turns to happiness as Millicent and Jack find passion in each other’s arms. Their fling quickly turns serious as Millicent finds happiness once again—and possibly her one true love. However, their relationship becomes complicated by her own uncertainty, Jack’s mortality, and the other man in Millicent’s life, Alexandre, her maker and companion. When Alexandre puts his foot down, Millicent must decide if she’s going to continue to be led by others or take the reins and drive the outcome of her life. 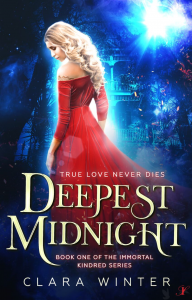 Deepest Midnight is set in modern day Savannah, Ga with occasional glimpses back to 18th century France. This is the first book in The Immortal Kindred Series. Clara Winter is the pen name of Amy Rugg. Amy grew up reading Anne of Green Gables, The Secret Garden, and Alice in Wonderland, while watching Buck Rogers, Star Trek, and Doctor Who. Writing her own stories naturally ensued. 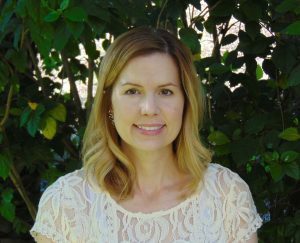 She is a wife, mother, and former school counselor, with a Master’s Degree in Counseling. Amy is from Colorado Springs, Co and currently resides in Mission Viejo, Ca. I'm inspired by beautiful locales, fantastical ideas, and historical events. I am an outliner/plotter through and through. I wish I could sit down and just write. The reality is, I need to know where my story is going before I dive in. I use a corkboard and sticky notes to plot my story, and notebooks to outline. Character sketches are created before the plotting begins. I try to write everyday Monday-Friday, and always go for an average of 2,000 words a day. I generally write at home, and coffee always helps! How do you develop your characters? Because I am a plotter, I usually know how my character is going to develop prior to beginning. Sometimes they surprise me by exerting their own will, but not often. I am mostly a fan of classic authors; Austen, the Bronte sisters, Hemingway, and Shirley Jackson are some of my favorites. Anne Rice is a contemporary favorite, and someone who I admire.